This comprehensive laboratory manual teaches students taking their first course in petrography the techniques of describing and classifying rocks as well as how to apply those techniques to common igneous and metamorphic rocks. Essential features include: a listing of common minerals with their most important distinguishing optical properties; over two hundred illustrations detailing the relation between optics and crystal morphology; an accompanying CD-ROM with color slides illustrating rock-forming minerals and the textures of rocks, many with text and audio annotations by the author; descriptions of the textures and structures of igneous and metamorphic rocks; the most important properties of all the minerals compiled in an easy-to-access, full-color table; and a chart for determining the approximate modal (volume) percentage of minerals in rocks. 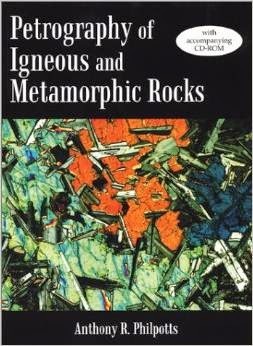 The classification of igneous rocks used in the book is the one proposed by the International Union of Geological Sciences (IUGS) Subcommission of the Systematics of Igneous Rocks. A list of commonly used rock names--many not part of the IUGS classification--is keyed to this classification. Also, the widely used Irvine- Baragar classification of volcanic rocks is included. Dr. Philpotts has organized a large amount of information to be easily and rapidly accessible. He provides students with a concrete foundation, giving them experience and confidence as they encounter the field of petrography.